University of Alabama officials have announced that the inaugural Bama Blitz raised more than $1.8 million in gifts from 1,810 supporters. Donors from 48 states contributed gifts to various projects across campus during the inaugural Bama Blitz fundraising campaign. Bama Blitz has a primary focus on building support for a series of unique and big-impact projects that might otherwise go without funding. Donors from 48 states pledged $1,810,269 to areas across the campus, capping one day, eight hours and 31 minutes of giving – a timeframe that celebrated UA’s founding year, 1831. 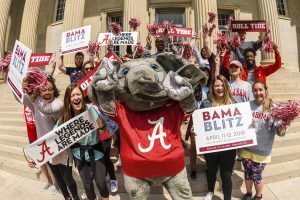 Bama Blitz, which began at noon April 11 and ended at 8:31 p.m. April 12, was powered by a robust crowdfunding and social media strategy that showcased fundraising “challenges” between colleges and schools and charted their gifts on a real-time leaderboard. “We are thrilled with the incredible success of the inaugural Bama Blitz,” said Bob Pierce, vice president for Advancement. “This type of time-limited, focused fundraising initiative has become very popular in the world of higher education, and we are glad to have our own version off the ground at the Capstone. Managed by the Office of Annual Giving, the campaign saw a significant boost thanks to volunteers who served as ambassadors. One college that benefited from ambassador support was the College of Communication and Information Sciences. Of the top five ambassadors, three of them were from C&IS, including the College’s dean, Dr. Mark Nelson. “Bama Blitz was an outstanding fundraising initiative and illustrates the power of connecting with our alumni and supporters all throughout the year,” Nelson said. Of the 1,810 gifts received during Bama Blitz, 98 percent were $500 or less, proving the impact a large number of small gifts can make. A commitment of $500,000 from the Frances and Jeffrey Fisher Charitable Foundation to support construction of the new Performing Arts Academic Center. A matching gift commitment of $20,000 from Denise and Phil Webb, of Anniston, in support of the Crimson Tide Scholarship Fund. A matching gift commitment of up to $15,000 from the UA Library Leadership Board in support of University Libraries. A significant contribution from Jack and Betty Moore, of Memphis, Tennessee, to enhance the Elizabeth W. Moore & Jackson W. Moore Endowed Scholarship. “The greatest success of Bama Blitz are the students who will be impacted through the incredible amount of donations from the UA family,” said Mary Lawhorn, director of annual giving. UA will conduct the next Bama Blitz in April 2019.